Home AP JOBs JOBS Railway Recruitment Board Recruitment RRB TS JOBs RRB RPF Constables Recruitment 2019, Online application form, How to Apply? 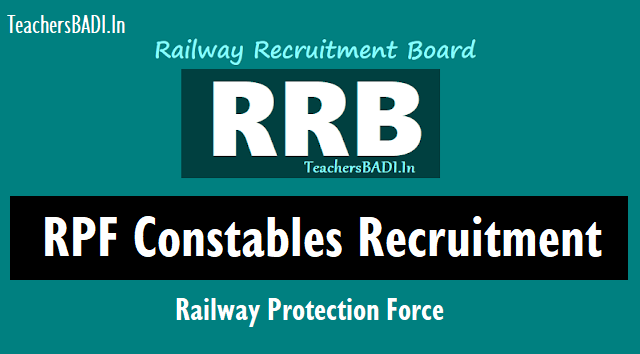 RRB RPF Constables Recruitment 2019, Online application form, How to Apply? RPF Constables Recruitment 2019: The Indian Railways has released recruitment notification for the posts of Constable, Tailor & Cobbler in RPF & RPSF. The notification was released in the Employment Newspaper of this week. The online application for 798 vacancies in RPF & RPSF would begin on January 1, 2019. The interested candidates can visit the online website of the Indian Railways or RPF on January 1, 2019, to submit their online application for the recruitment examination. As per the RPF recruitment notification released by the Indian Railways, the last date to submit the application form online is January 30, 2019. Aspirants who want to apply for these 798 vacancies can check the RPF recruitment notification PDF on the official website. RPF Constable Posts Recruitment 2019, Apply Online for 798 Constable (Ancillary) Posts via rpfonlinereg.co.in. Indian Railways will hire aspirants for Constable (Ancillary) posts in Railway Protection Force(RPF) and Railway Protection Special Force (RPSF). Indian Railways have invited candidates to apply for 798 posts of Constables through the official site of RPF at rpfonlinereg.co.in. Interested candidates can apply for the post before January 30, 2019.
a. Educational Qualification: Candidates should have passed SSLC/Matric from a recognized Board. b. Age Limit: The age limit should be between 18 to 25 years of age. The selection process comprises of Computer-Based Test(CBT), Physical Efficiency Test (PET) & Physical Measurement Test (PMT), Trade Test(TT) and Document Verification (DV). Candidates who will appear in Document Verification will be sent for a medical examination at the Railway Hospitals. Candidates who will apply for the post need to pay Rs 500/- if belonging to general category and rs 250/- if belonging to SC/ST/Ex-serviceman/female/minorities/economically backward class. Selection Process: The selection of the candidates would be on the basis of CBT, PMT, PFT, Trade Test and DV. The shortlisted candidates will have to undergo a rigorous initial training in any one of the RPF/ RPSF training center. RRB Constable Posts Recruitment 2018: The candidates should ensure that they fulfill eligibility conditions before applying. The candidates should be between 18-25 years of age on July 1, 2018. Only candidates who have a SSLC/matric degree from a recognized board are eligible for constable (executive) post. The online computer based exam will be held tentatively in September and October. The selected candidates will be offered Rs 21,700 per month as salary plus allowances. Note: The detailed advertisement can be seen in employment news dated May 19-25. RRB Constable Post details: Online applications are invited from eligible Male and Female candidates for the recruitment of Constable for the vacancies in Railway Protection Force (RPF) of various Zones of Indian Railways and Railway Protection Special Force (RPSF). Age: 18 to 25 years as on 01.7.2018. Scale of Pay: Rs. 21,700 plus other allowances admissible at that time. Selection Process: Based on Computer Based Test (CBT), Physical Efficiency Test (PET) & Physical Measurement Test (PMT) and Document Verification (DV).